For high quality cabinet refinishing in Huntersville, North Carolina residents have trusted R and R Painting NC LLC's cabinet refinishers for years! When it comes to refinishing cabinetry in Huntersville, our skilled craftsmen do the job right, maintaining our commitment to quality and high standards. We at R and R Painting NC LLC have the expertise and dependability that you are looking for. We offer the most professional and affordable cabinet painting in Huntersville, NC. R and R Painting NC LLC has been painting cabinets, staining cabinets and glazing cabinets in Huntersville since 1977 using a variety of paint colors, finishes and textures. 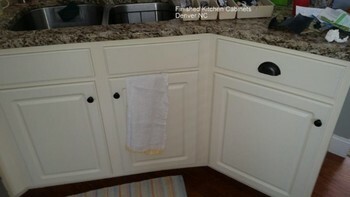 Our cost-effective cabinet resurfacing in Huntersville extends the life of your cabinets and saves you money. Don’t buy over-priced new cabinets when R and R Painting NC LLC offers competitive pricing for refinishing cabinets in Huntersville. Let our experienced cabinet painters in Huntersville be your one-stop resource for cabinet painting or cabinet staining in Huntersville. Need a kitchen cabinet makeover in Huntersville? Don’t hesitate to call us! R and R Painting NC LLC are the leaders in refinishing kitchen cabinets for homeowners. We will refinish kitchen cabinets and fix your aged and cracked cabinet panels so they look like new again. If you want to update your kitchen, R and R Painting NC LLC resurfaces cabinets in Huntersville for a fraction of the cost of new cabinets. We are the cabinet repainting company in Huntersville to rely on when you’re looking for quality workmanship. Since 1977, R and R Painting NC LLC has been providing custom cabinet refinishing in Huntersville. Our attention to detail and excellent customer service is what has kept us in business and keeps our customers coming back! You can trust that R and R Painting NC LLC's professional cabinet refinishers in Huntersville are as courteous as they are knowledgeable and that you will be delighted with your updated cabinets. Contact R and R Painting NC LLC about your cabinets refinishing project in Huntersville, North Carolina. Our Huntersville cabinet painting crew will be happy to provide you with a competitive quote and stand by the outstanding cabinet refinishing service that we deliver.